Isn’t Electronic Dance Music such a vague term? Dubstep does not sound like Techno. House does not sound like Gabber, yet somehow samples get bundled together under the umbrella of EDM, regularly. It does not matter whether you’re aspiring to be the next Tiësto, Hardwell, Skrillex or RedOne, as there are samples within each pack to suit a wide range of production styles. So, open a cold beverage of your choice and put your favorite pair of headphones on so you can listen along. This article explores a wide range of samples, FX and loops suitable across a variety of genres that fall under EDM. 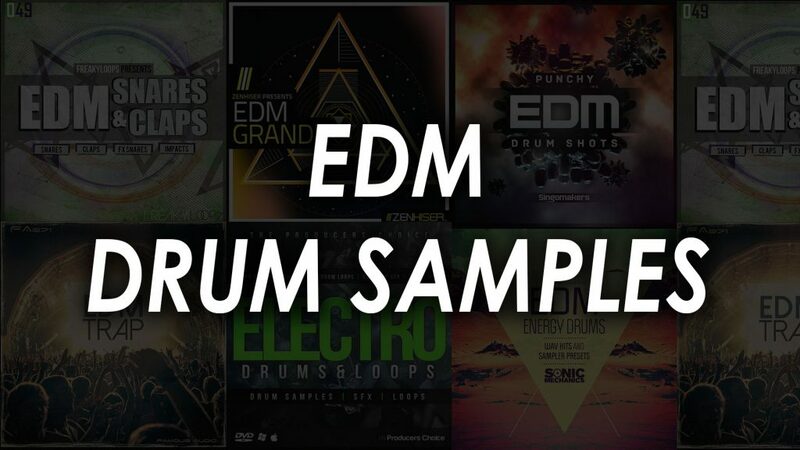 Below is a short list of the EDM drum samples we talk about in this article. Scroll down for more details or click for audio demos. Do you crave club-ready drum samples? Do you envy the sounds of David Guetta, Deadmau5, and Swedish House Mafia? 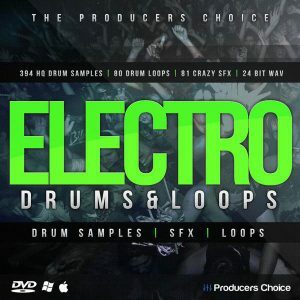 The Producers Choice presents Electro Drum Samples, FX & Loops, a collection of lit samples out of the box, ready to transform your productions from bedroom to main room. This pack contains handcrafted loops & FX, as well as crisp, pounding electro drums. Ideal for anybody producing in Urban, Electro, Dance, House, Dubstep and EDM spaces. This collection pays homage to world-class hitmakers such as RedOne, Avicii, Tiësto, and Skrillex, bringing you all the essentials for crafting a hit electro track. With 395 drum samples, 71 loops and 81 FX, The Producers Choice have provided an extensive library for your enjoyment. All loops are at 128bpm, the standard main room smash tempo to help you groove from the go. Need inspiration? Audition the drum loops and drop your favorite into your DAW. Supplement the loop with one-shot kicks, snares, and claps for extra power. The golden section of the whole package lies within the FX folder. Drop an upsweep into your DAW session to increase the excitement before your payoff and voilà! Your drop never hit so hard. All samples are HQ 24-bit WAV files for use in whichever DAW or sampler you prefer. All loops are preformatted for seamless looping within FL Studio. Freaky Loops’ EDM Snares & Claps is textbook EDM. Whether you are looking for a standard EDM clap, an impact snare or a heavily processed layered clap to bring a new section in, this pack has it all. The kick may drive a track forward, but a killer snare is key to a steady and phat beat. Whether it’s dirty and phat, crisp and crunchy or tight and hard, this collection has you covered. Ideal for producers working with Electro House, Progressive, Techno, Minimal and other forms of EDM, though a great addition to any genre. The variations of claps and snare samples within this collection can add inspiration for those stuck in a rut. Try replacing or layering a weak snare or clap sound to help add some serious punch to your beats. EDM Snares & Claps contains 205 hard hitting snares and 20 bonus loops & samples, all recorded as HQ 24-bit WAV files. Just because they say EDM, does not mean they must stay EDM. Experiment with blending more transient into your rock drums with a short impact snare. Browse through the 45 clap layered snares, to find a hit that has all the punch of an EDM snare, as well as the crispness and length of a clap. Do you have a space between your build up and your drop, but don’t know what to put in there? Try one of the 30 impact claps or 30 impact snares. The reverb tail on the impact samples adds a beautiful anticipation to a beat when used in this way. Are you pining to tear up the dancefloor with your next track? Prepare yourself. 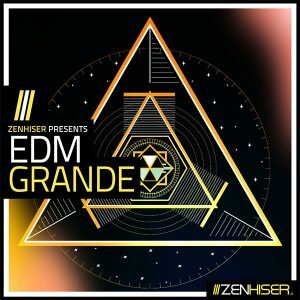 Zenhiser’s EDM Grande is an engaging and overwhelming EDM collection, guaranteed to stun the listener. An eclectic and creative pack, EDM Grande is jam-packed with EDM hits, making an enormous statement to its competitors. 11+ GB worth of samples covering Modern EDM, House, Progressive House, Big Room and more. From ethnic chanting to full frontal EDM monsters, this pack will transfix any producer that comes into contact with it. An addictive trip, for sure. The attention to detail is particularly impressive. Whether that’s individual drum sample stems, dedicated vocal FX or separated melodies, you are bound to be wowed. The professionalism of the programming is second to none, with MIDI files included allowing further programming down the line. This EDM sound pack will help your tracks slam like never before. EDM Grande’s influence on your productions will have your fans experiencing intense aural beauty and devastating power, all in a singular experience. This pack is ideal for both newbies and pros. With 10 genre-spanning song starters, this pack can help kick-start your inspiration in a way singular loops cannot. 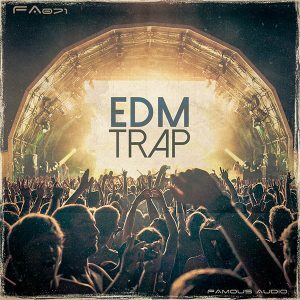 Famous Audio’s EDM Trap is a pack full of fresh and energetic sounds to transform your flat beats into phat beats instantly. Ideal for anybody working within EDM, Trap, Dubstep, Electro-break and D ‘n’ B, though just as applicable for injecting the sound of today’s popular music into your beats. If your programmed Trap beat is lacking power, try a drum loop from this pack. Hard hitting and booty shaking. Leads not cutting through? These screeching electro leads jump out of the speakers. Blend quake-inducing subs tastefully with the drum loops to introduce your chorus with serious impact. EDM Trap also includes typical trap favorites, too. Dark Trap brass, dark Hip-Hop strings, and boomy 808 bass samples are all added to help you create EDM and Trap hits. This collection of samples includes 159 loops and samples locked to 90bpm. Instant Trap tempo to help you get off to a great start. If influence is what you need, Famous Audio has also included an inspirational full track containing a full mix and seven stems. This is a cool collection, blending the best elements of Trap and EDM into one very current sounding package. 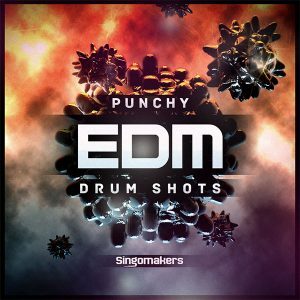 Singomakers’ Punchy EDM Drum Shots is exactly what it says on the tin. An extensive collection of extremely phat and hard kicks, epic claps, power snares, hi-hats, crashes, rides and EDM friendly percussion, this kit is an ideal collection for EDM producers. 40 kick samples containing key info will let you tune your kicks to the track. If you haven’t experimented with tuned kick drums before, you won’t know how you ever made a beat without them. Have your low-end slam, while remaining musical. As well as the 40 kick samples, there are another 220 drum samples. Your clap, perc, hats and crashes collection just got deeper. Perhaps the best feature of the sample set is the 4 soft sampler patches for NNXT, Kontakt 2+, Halion, and EXS24. Open one of the 4 soft sampler patches and welcome preset edm drum kits in front of you. Get hammering on your MIDI controller of choice and program outstanding drums for your latest beats. If the patches don’t inspire you, just drag other samples from the collection in and tweak to taste. Inspired by the likes of Knife Party, Martin Garrix, Hardwell, Nicky Romero and more, this pack is ideal for the producer looking to get the dancefloor bouncing with their latest tune. If you’re looking to add dimension to your drums, EDM Energy Drums by Sonic Mechanics is the pack for you. A one-stop shop for producers of House, Techno, Trance, Minimal, Garage, Dubstep, Trap, Nu Disco and D ‘n’ B. Inject high energy club sounds into your productions with this collection. Each sample has been layered, sculpted and processed to enhance the nuances of each sound. Choose from over 390 samples, including 79 kicks, 84 snares, and 84 percussion hits – as well as cymbals and claps. Included with this EDM sample pack are 23 soft sampler patches for Battery, EXS24, Halion, Kontakt, and SF2, allowing you to sequence the perfect drum part using MIDI. 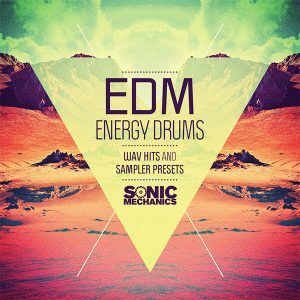 Whether it’s tight kicks or crisp claps, EDM Energy Drums has it all. These sound pack a serious punch with plenty of power. One of the defining features of the pack is the percussion hits. Sick of the same old bongo/conga hits? This pack is much more unique than that. Add original percussive flavors to help keep your groove shaking along. The genre-spanning versatility, along with soft sampler patches for preset drum kits, makes this pack a serious investment for anybody wanting to craft energetic EDM hits. As always, I hope you got a lot out of reading this article. EDM spans such a wide range of styles, sounds, and attitudes that finding the right samples can be difficult. I cannot stress enough the importance of visiting each of the above links, listening to the samples, FX, and loops for yourself. Listen for where or how you could incorporate them into your tracks. EDM is arguably the most popular genre in music right now (alongside Trap). It would, therefore, be wise to invest in the best sounds to help stand above your competitors. Whether you’re the king of one-shots or want some new drum kit presets for Kontakt, there’s a pack in this article to keep the bounce floor jumping and booties popping.